A classy and meaningful Melodic Black Metal project aiming at opening our eyes and show us that we, mankind, are our own blessing and our own curse. These dark, poetic words perfectly summarize the music you’ll find in The Thawing Winds Of The Morning Sun, the debut demo by German Melodic Black Metal project Through Chaos & Solitude, led by multi-instrumentalist Tim Rule (Forward to Eden) with the help of Sebastian D. (Castigator) on drums. Featuring a serene cover art by Pottriot Illustrationen, and written, recorded and mixed by Tim himself during this past winter in the city of Ruhrpott in North Rhine-Westphalia, the most populous state of Germany, The Thawing Winds Of The Morning Sun brings beautiful, melancholic and dark music in the vein of bands like Woods Of Ypres, Agalloch and Falls Of Rauros, with each one of its three songs sending a thoughtful message about life and death, our souls, our existence and our struggles. The initial sound of the howling wind in the first song of the demo, titled The Intransigence Of The Soul, is suddenly joined by an onrush of heavy guitars and blast beats, with the demonic gnarls by Tim giving life (or I should say death) to the song’s poetic lyrics (“Constant struggle of the mind and the heart / Constant suspense of the body and the mind / Persistency in the thought – restlessly moving on / Intransigence of the soul…”). Furthermore, anguish, despair and loneliness are just a few of the emotions explored by Tim in this piercing Black Metal chant, ending in an acoustic and pensive manner before we face the second piece of the demo, A Heart Of Eternal Winter (And The Longing For Your Warmth), which builds a direct bridge to the opening track, beginning in a slow-paced rhythm inspired by the obscurity of Doom and Gothic Metal, also showcasing acute Black Metal blast beats by Sebastian D. and a somber ambience. Tim’s phantasmagoric vocals embrace us in darkness at first, shifting to his hellish growls and back to melodic clean vocals and, therefore, creating a nice paradox of voices inside our minds. Also connected to its predecessor, If This Is The Best We Can Get Then I Am Disappointed brings forward obscure acoustic guitars and once again the haunting sound of the wind while Tim darkly grasps the song’s austere lyrics, which present his personal view of mankind (“Evolution has brought us so far / And still – look where we are / Creating life and taking life / All in the same conceited breath / We are appointing ourselves to gods / Whereas declaring him for dead / If this is the best we can be / Then please let it end with me / Evolution has brought us so far…”). In addition, this composition is another excellent sample of the clash of distinct sounds Tim enjoys putting together, displaying slow and steady beats à la Doom Metal during its first half, whereas the second part of the song brings an explosion of heavy and dissonant sounds that lives up to the legacy of Scandinavian Black Metal, until it finally reaches its lugubrious ending. 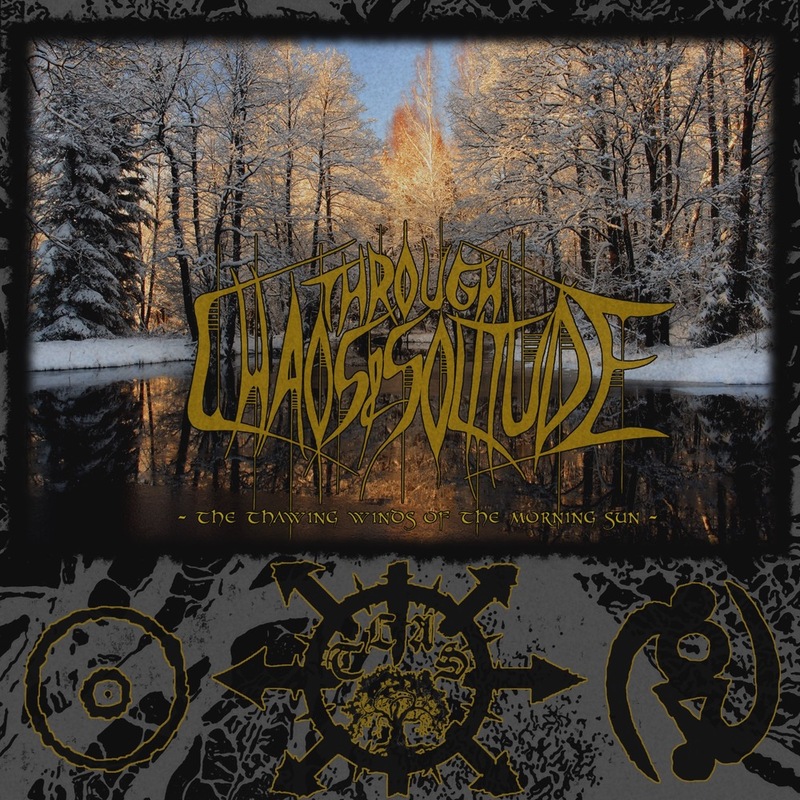 In summary, Tim and his Through Chaos & Solitude are not only offering us well-crafted, harmonious and dark heavy music, but he also discusses important topics about the dangerous direction mankind is taking, pointing to our dread but inevitable extinction. If you’re a metalhead that’s always in pursuit of high-end music coming from independent artists and bands who also care about the content and message transmitted through their creations, Through Chaos & Solitude might be exactly what you’re craving, and obviously don’t forget support this brand new project by purchasing The Thawing Winds Of The Morning Sun at the Bound By Modern Age Records’ BandCamp or webstore (in tape or CD format), at the Mark My Words Records’ BandCamp or webstore, or at Discogs. Let’s hope Tim goes on with Through Chaos & Solitude, a classy project with a meaningful message that only brings more energy to his already excellent Melodic Black Metal, and that mankind finally opens their eyes for all the wrongful things that are happening in our world before it’s too late. Best moments of the album: The Intransigence Of The Soul.